“Girl Scouting builds girls of courage, confidence, and character, who make the world a better place” (Girl Scout Mission Statement). 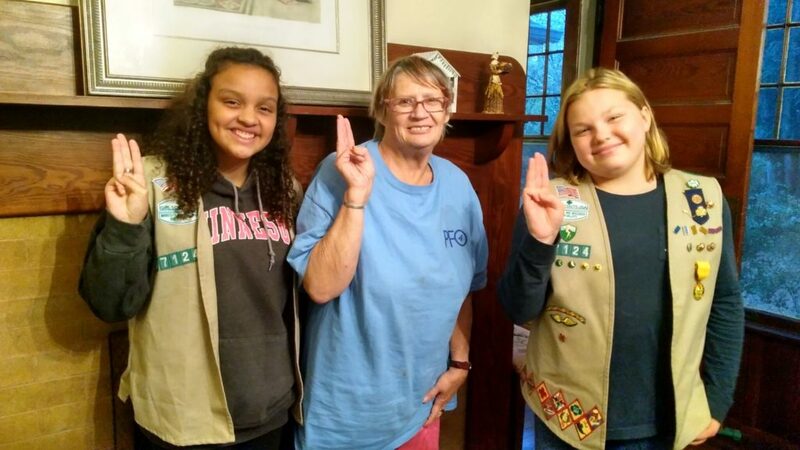 Girl Scout troop leader Lynette, with her Cadets Ella and Tess, started the school year by identifying how they would invest their time in the community. 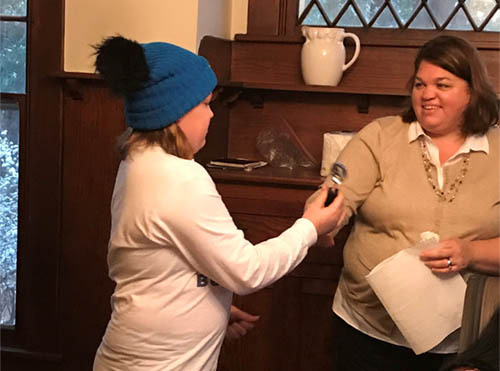 Previously, Tess had volunteered at Sojourn through Minnewashta Elementary School. 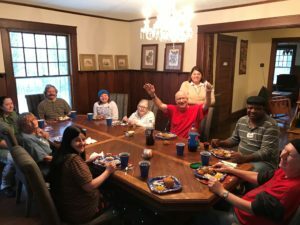 After a great experience, she recommended they contact Sojourn on how they could volunteer. Ella and Tess decided they would like to host a Family Fun Night at one of the Sojourn Suites on Friday evenings. The girls provide and serve family style dinner and dessert to the Sojourners and end the night playing games. Ella and Tess use the money earned from cookie sales to buy the dinners for Family Fun Night. No badges rewarded, no community service hours earned, just the satisfaction of interacting with others within the community. Connecting and socializing with individuals outside their peer group has been a huge benefit for the sixth graders. “The girls really enjoy getting to know the individuals at Sojourn,” says Lynette. Seeing their hard-earned money in action for others is very impactful. such great personalities and it’s inspiring that the caretakers want to stay and spend time with everyone. “Kari is so supportive and a good person all around. I know she has made an impact on Ella’s life; seeing someone who is committed and puts her whole heart into her job is truly amazing,” shared Lynette. Life is busy for everyone, be it full time jobs, school, sports or extra-curricular activities. Sometimes, it is difficult to stop and truly be in the present. “The gift of time to me means, what am I doing for someone other than myself,” says Lynette. Turn off cell phones and dedicate time to focus and engage with the people around you. Lynette, Ella and Tess have truly given the individuals at Sojourn the gift of time. Thank you, Lynette, Ella, and Tess for the selfless time you have shared with us this holiday season. From talking about our favorite Girl Scout cookie flavors to playing card games, we will cherish these memories. Your generosity is so appreciated, and we know your future is bright when it comes to making a difference in the community. We wish you a very Merry Christmas and wonderful New Year!